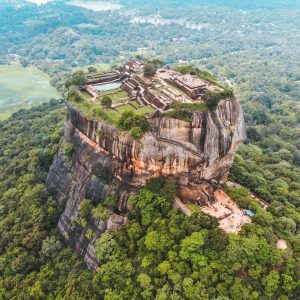 If you’re planning a trip to Sri Lanka and currently researching the best things to do in Sri Lanka I’m sure that you’ve already seen pics of Sigiriya Rock – one of the most iconic spots in this beautiful country – and a highlight of any tour around Sri Lanka. What Does Entry to Sigiriya Rock Cost? How Tough Is The Climb To The Top? 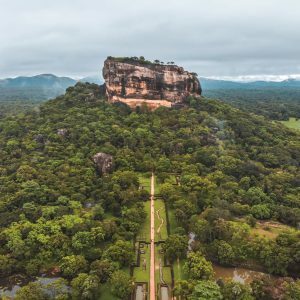 Can I Drone Sigiriya Rock? Sigiriya Rock is also known as Lion Rock as the entrance to it was originally carved into a giant Lion, unfortunately however only the feet now remain. A UNESCO world heritage site it was originally used as a monastery, but in the second half of the 5th century it was turned into a royal residence by King Kasyapa. It stands a proud 200m tall amongst an otherwise flat landscape filled with jungle and peppered with small villages, dominating the skyline and pretty impressive even from a long distance away. And with 1200 steps to the top it’s easy to see why the King used this given it’s natural defenses! Sigiriya Rock is located about a 4 hour drive from Colombo City (which you can easily fly into international with the likes of Sri Lankan Airlines), between Dambulla and Habarana and was about a 20 minute drive from my base at Cinnmaon Lodge Habarana. Given it’s popularity amongst travellers there are plenty of accommodation options in the area to suit all styles and budgets, with many guided day trips available. You’ll also find it as one of the main inclusions of any longer tour in Sri Lanka as it’s one of the countries main attractions. Due to its status as a UNESCO world heritage site there is now an entry fee to Sigiriya Rock, currently $35USD per person. Pretty steep for a country which is relatively cheap to travel around but that money does go towards the preservation of Sigiriya and the maintenance of it. …alternatively you can climb there nearby Pidurangala Rock which offers epic views of Sigiriya, however recently (due to some people ruining it for everyone else by doing stupid things!) this has now also been classed within the heritage site and entry fees and restrictions now apply – although fees there are much lower. If you do have the time it’s well worth doing both if you can! Mirror Wall – this section of the climb to the top is named after the fact it used to be so shiny the King could see himself in the reflection. It’s also covered in inscriptions from visitors to Sigiriya for hundreds of years, however it’s now illegal to add any more. Old Palace –the ruins of the old royal residence on the very top of Sigirya still remain and it’s pretty incredible to think how difficult it must have been to transport everything to the top, let alone build a mini city! The Lions Feet – the lions feet mark the main entrance to Sigiriya, however there once was a huge Lion carved into the rock as well. Even still the feet themselves are pretty impressive so take the time to check them out before the final part of the climb. Water Gardens – at the base of Sigiriya are the water gardens which also include gravity fed water fountains – which is pretty incredible technology given the fact they’re over 1,600 years old! It’s roughly 1,200 steps to the top of Sigiriya Rock and the climb is done via a combination of old stone steps, metal walkways, a spiral staircase and metal staircase built into the side of the main entrance of the Lions Feet. For someone with a pretty hectic fear of heights some of the final parts of the climb (including the spiral staircase to the Frescoes) was pretty full on, but don’t let that put you off! Overall though it’s well worth sucking it up and ploughing through as the views from the top of Sigiriya are pretty incredible – with 360 views across the surrounding jungle and countryside. I’ve done the climb to the top twice now and if it fits in with your plans time it to do sunset at the summit – it makes an incredible view even more spectacular and is a great way to finish a day of adventure in Sri Lanka! 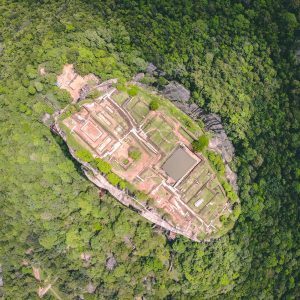 On a slight side note if you’re travelling with a drone and looking to get some epic shots of Sigirya Rock like the ones in this post be aware that you do need a full permit for shooting drone footage at Sigiriya. …which is a pretty lengthy process and includes having to register your drone with the aviation authority and applying for written permission. There are some hefty fines in place and the security there is pretty tight so I wouldnt risk it without this as we still had some issues with an overly power hungry security guard at the top who made life extremely difficult despite us having full written permission and supporting documents. Are you heading to Sri Lanka soon? Is Sigiriya Rock part of your bucket list? ?